In the Bantu languages of Uganda, ‘Kabira’ translates as ‘little forest’. It is home to several rare species of flora & fauna, especially tropical birds, such as the African Grey Parrot and Blue Turncoats. To this day we ardently preserve this natural haven and wildlife habitat. 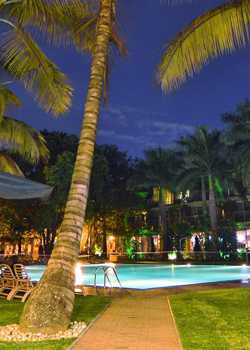 Set amongst a foray of palm trees in an idyllic suburb and less than a 15-minute drive from the hub of Kampala city, Kabira Country Club is the premier boutique hotel in the city. Through the gates and up into a lush and courtyard the club is cut off from the clamour and hustle that surrounds it. The hotel provides unrivalled luxury and is the perfect setting for a weekend getaway, a holiday location, a memorable wedding setting and a business and conference centre. Along with a fully equipped gym, we have world class sporting and recreational facilities which cater for a wide range of fitness and wellness needs. We have 2 heated swimming pools, 3 squash courts, a sports field, four clay floodlit tennis court and floodlit basketball court and spa. Our rooms make living at Kabira Country Club unrivalled and perhaps, superbly lethargic. Concentration to detail is what we pride ourselves on that our designers have gone to great lengths to make sure that all our rooms and cottages have been premeditated to make your stay with us memorable. One of marvels about Kabira Country Club is the bakery where nothing is too big for us to accomplish. The bakery churns out everything from cookies to pastries and six different varieties of croissants. But one of their strong points is in made to order designer cakes of any shape and texture and meets the daily demands of Victoria Cafe, Delhi Public School International, Speke Apartments and of course Kabira Club. More and more people are into healthy living – right from the food they eat, what they drink to regular excising. The gym at Kabira Country Club understands that people are different, have different body mass and have different needs. With that in mind, we have personal trainers on hand who will assist you in your quest for perfection and also recommend a diet for you. Whilst the gym has all the necessary equipment from spin bikes, tread mills to benches and say leverage systems, it’s not a case of clambering onto them and working away. Again, this is where our able gym instructors come into the foray and will guide and advise you on what you should be doing and for how long. The gym also holds regular zumba, yoga, sukuma, spinning aqua aerobics, bumpy rides, kick boxing, konna dance work out, konna cycling and pilates classes. External to the gym, the club also boasts a heated swimming pool, two glass backed squash courts, clay tennis courts and a basketball court. Awash in waves of transcendent mood lighting, The Terrace sweeps all the way down from the restaurant and bar – right the way down to the coffee shop and overlooks the swimming pool and the courtyard which gives a tranquil outdoor and informal dining experience. Serving breakfast, lunch, afternoon tea and dinner, The Terrace presents contemporary and delectable dining from the menu and buffet with mouth-watering array of food from around the world. If fine dining is something you seek with mood lighting and music, it’s on the menu here. A simple sit-down buffet? Again, the restaurant will leave you satisfyingly replete. 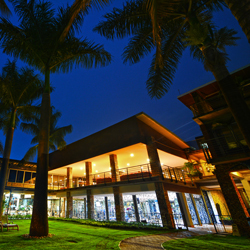 Kabira Country Club has one of the finest conference and meeting venues in Kampala. Our conference venues have capacity for large events and the flexibility to accommodate your needs from the latest technological gadgets, on-site support staff who are able to handle anything from the largest to the smallest events.